AVG is my first preference when it comes to free antivirus softwares. 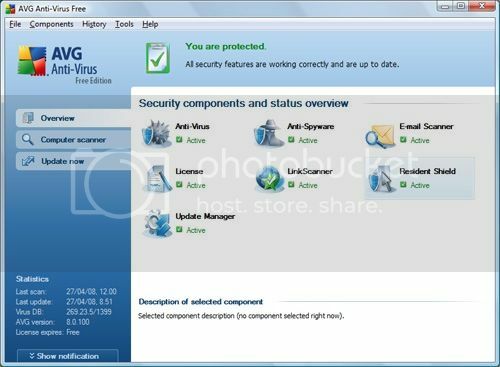 The free edition comes along with free antivirus, anti spyware, link scanner, and AVG Security Toolbar. That’s more than enough for a free software. But, if you want some more features like protection against identity theft, hacker attacks, infected downloads, infected instant-messaging and spam, protection for business computers, networks, and servers then you need to get The AVG Pro or the Internet Security. Avira AntiVir Personal – FREE Antivirus is a reliable free antivirus solution, that constantly and rapidly scans your computer for malicious programs such as viruses, Trojans, backdoor programs, hoaxes, worms, dialers etc. Monitors every action executed by the user or the operating system and reacts promptly when a malicious program is detected. It is a comprehensive, easy to use antivirus program, designed to offer reliable free of charge virus protection to home-users, for personal use only, and is not for business or commercial use. It is available for Windows and UNIX. The PC Tools Antivirus Free Edition is of two types- registered and unregistered. The difference between the two is that if you download the registered version you will be entitled to receive high speed updates and 24/7 technical support. PC Tools Antivirus keeps your pc protected against the most nefarious cyber-threats attempting to gain access to your PC and personal information. Going online without protection against the latest fast-spreading virus and worms, such as Netsky, Mytob and MyDoom, can result in infections within minutes. Once infected, the virus will usually attempt to spread itself to your friends, family and associates by accessing your email contacts and networked PCs. The infection may also allow hackers to access files on your PC, use it to launch attacks against other computers and websites or to send mass SPAM email. PC Tools Antivirus keeps you safe from all such threats. Comodo released a new version of their free Internet Security software. Comodo Internet Security 3.10 includes many new features and services, including Comodo Secure DNS, Comodo HopSurf and the ability to specify alternative URLs for program and virus updates. During the installation process you can choose what you want to install (Install only AntiVirus, install only Firewall, or install both Firewall and AntiVirus). When we take performance into consideration, Comodo Internet Security is not a great choice as it doesn’t detect certain malwares. But, nevertheless it’s a good software. Avast! Antivirus Home Edition available for is free. It protects your pc with multiple shields that scan executables and files. It’s pretty easy to as it has a friendly interface. You can select parameters for scanning, and even choose wildcards to exclude specific file types. You can adjust the sensitivity level for the program’s detectors when it comes to scanning downloaded files, instant messages, e-mails, and a host of P2Ps. The best part is that it’s light on system resources and you it updates databases automatically on a regular basis. The only thing weird about this software is the look of it, it reminds me of something like Nero showtime. I feel the look of a music player is weird for a antivirus software. Well, that’s just my opinion though. 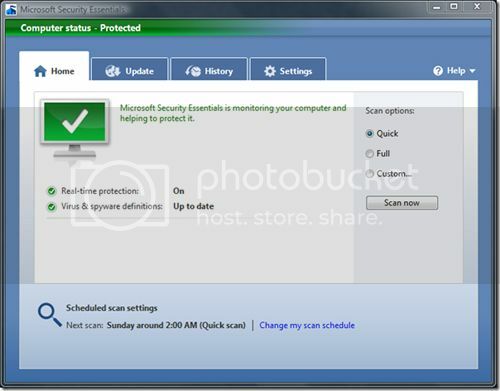 Microsoft Security Essentials is currently in beta stage but you can try it out for free. The final version of the software will be out by this year end. It’s pretty good at detecting malware. New unknown malwares also get detected. Whenever the software comes across a potentially malicious file that doesn’t match known malware, it contacts Microsoft servers for additional analysis. This is pretty good but the problem is it results in more time consumption. The user interface is friendly and easy to understand too. A-Squared Free Antivirus is yet another free antivirus software. The latest version, i.e. ; 4.5 is loaded with lots of features. In addition to detecting and removing viruses, a-squared also detects spyware, adware, keyloggers, Trojans, backdoors, worms, bots and dialers. Kaspersky Virus Removal Tool is not an antivirus or internet security software but just a virus removal tool. We all know how good Kaspersky products are; hence we can trust upon this tool. It has really good virus detection rates and strong removal capabilities. But, the disappointing thing is that you need to download the whole file again if you want to update the signatures.